Geoffrey Key is indisputably one of the best, most important and commercially successful artists to have emerged from the North West of England for many years. To anyone from this part of the country who has even a passing interest in art, Geoffrey’s work will be instantly familiar. His career spans more than 50 years and he continues to gather new followers well into his 70s. By almost all measures, Geoffrey Key is at art’s top table. More than 20 of his works are in public collections; he is collected, and has exhibited, globally; every commercial gallery of note in the North West sells his work (and has had to buy it first); and If one of the most important measures of an artist is how many people they influence, then Geoffrey is second only to Lowry – his clouds, in particular, are one of the most borrowed motifs in the Northern School. Much has been written about Geoffrey over the years, so we will not repeat it here. Instead, the focus of this Exhibition is on what the market sometimes misses - namely the sheer breadth of Geoffrey's work, his longevity as an artist, and how every decade or so, his work reinvents itself. Most collectors are most familiar with his recent work - oils of lavish colour and of fantastical, impossible geometry. But what recent collectors sometimes miss is that this period of bright colour represents only around one-third of his artistic career – Geoffrey’s use of colour began to change markedly after a visit to Hong Kong in the 1990s, a change instigated by the different light he encountered during the visit: “It was what I had been looking for, something that just changed the way I saw colour”, he later remarked. This exhibition is a much needed mini-retrospective. The earliest work on display is from 1964, when Geoffrey was just 23, and the most recent from 2016, when he was 75. All decades in between are represented, covering prints, drawings, mixed media and oils. Geoffrey is one of the few artists alive for whom such an exhibition would even be possible, a display of works from 6 different decades – and this, as much as anything else, is a measure of his importance. 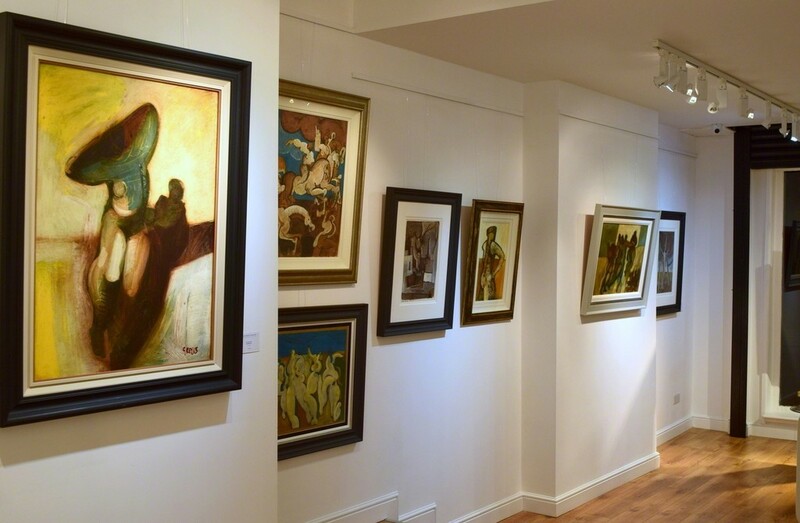 Everyone has their own favourite Geoffrey Key period or subject matter – for us it is the mid to late 1960s, a period when his instantly recognisable style began to emerge. This has become known as the “Nab” period – named after a hill in Derbyshire that Geoffrey painted obsessively. This story is instructive in what makes Geoffrey such a unique artist. He was taught by Harry Rutherford at the Manchester School of Art, who had in turn been taught by Walter Sickert, and as Geoffrey has recounted: “Harry was painting bad Sickerts and I was painting bad Rutherfords.” To rid himself of these influences, Geoffrey painted the Nab constantly at all times of the day and year, saying: “In painting the Hill (the Nab) I burnt off all the influence I had from Harry, not the mathematics of painting, but I ended up with work that was hopefully me." Initially the pictures were just of the landscape, but after a while, figures began to emerge from the landscape, and these Nab figure pictures, several of which are featured in this exhibition, are fabulous in their own right and hugely important in the development of Geoffrey as an artist – and deserve to be valued by collectors as highly, perhaps more so, than his later work. 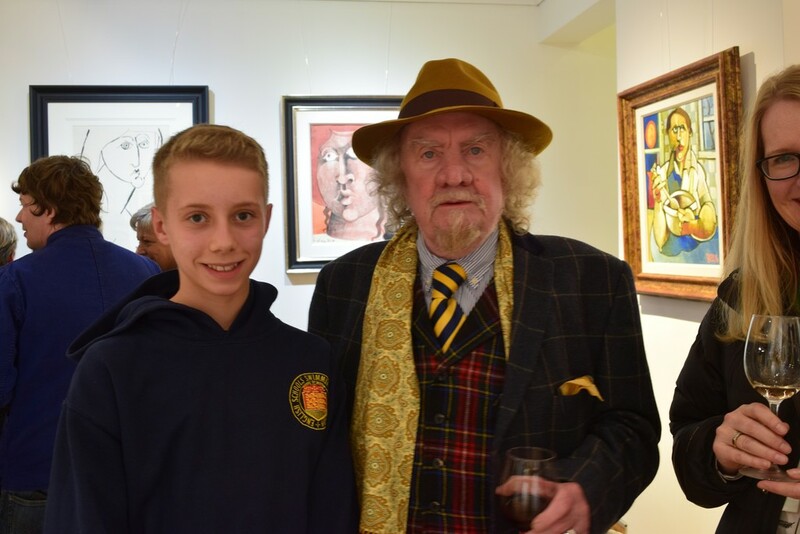 We are proud and delighted to have such a representative sample of Geoffrey Key’s artistic output on display, and we hope it goes some way to putting his pictures into their proper context.